Whether we’re aware of it or not, our minds, bodies, and souls often seek out what’s comfortable. 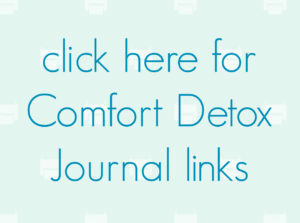 In Comfort Detox, you’ll read about a journey of self-discovery, identifying our own inherent drive for a comfort that cannot truly fulfill or satisfy. Practical insights and exercises help you find freedom from the lure of the comfortable. This detox will allow you to recognize pseudo versions of comfort and replace them with a conviction to embrace God’s true comfort. Discover the secret to countering the comfort addiction and become available as God’s agent of comfort to serve a world that longs for his justice and mercy. God’s severe mercy is beckoning us all from false comfort’s grip, leading us all to know the God who longs to comfort our hearts in full. Take the Risk-Taking Test at PsychTests.com. Listen to this podcast with Amy Carroll, author of Breaking up with Perfect. Take the Savior Complex Quiz at Revival Magazine. * I am in no way endorsing CARE International or asking you to donate to their work. Watch “The Danger of a Single Story” TEDTalk by Chimamanda Ngozi Adichie. Listen to “Come Close Now” by Christa Wells. Watch “From Being Undocumented to Becoming a U.S. Citizen” by AJ+.